Anyone that knows me in real life knows that Wal-Mart is my second home. I had to actually scale back on my visit. I can pick up everything I need in one place and I love it. Plus, you can’t beat the prices. I need to work on my list for my shopping trip for Sunday. Anywho, I am sharing my 5 Must Have Fall Handbag Essentials sponsored by U by Kotex and Wal-Mart. I have been known to carry a rather large purse. I blame it on being a mom but let’s tell the truth, I carried a big purse before the kids. I have everything in my purse but the kitchen sink. When I was in law school they called me “Momma Tee” because everyone knew whatever they needed was in my purse or car. I have a small bag that I carry within my purse that carries my essentials. Equate Allergy Relief– I am allergic to everything and there is nothing more miserable than being out and about having an allergy attack. Plus, I refuse to carry by Epipen. Don’t judge me. 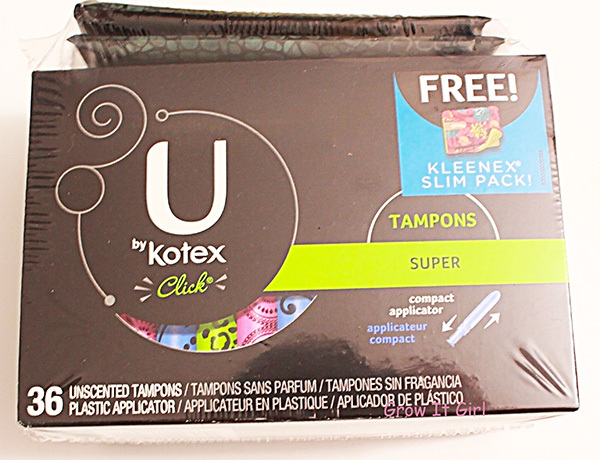 U by Kotex Tampons – I switched to these a few months ago after receiving a sample. I love the applicator on these and there is no pinching. What? I’m just saying… I also use their pantyliners. I bought the liners awhile back because Wal-mart was out of my normal brand. I’ve used them since and haven’t looked back. The tampons are unique because of the colors. I feel a little less traumatized after using the product (read between the lines) and I am a sucker for anything purple. Kleenex Slim Pack Tissues – Just in case I have an allergy attack or need to wipe my hands. If you buy the U by Kotex slim package, you get a free pack of Kleenex. I love it when I get freebies. EOS Lip Balm – I am so addicted to this lip balm. I am a serious lip bitter and this helps keep my lips from chapping. Plus, it deters me from biting my lip. I’m weird…I know. Hand Sanitizer – I have OCD and I can’t leave home without my sanitizer or wipes. No, seriously I have been diagnosed with OCD. I have been known to turn around and head back home if I don’t have my small bottle of sanitizer. I have always kept a pump bottle in the car for emergencies. Heck, as my daughters got older this became one of their essentials too. Now, I have a perk for you. U by Kotex is offering a coupon. The more times share the deets about the offer and U by Kotex on Twitter, Pinterest, or Facebook, the higher the coupon value! The value of the coupon for Kleenex ($0.50, $0.75, $1) and three for U by Kotex ($0.75, $1, $1.50). Stop by your local Wal-Mart and pick of one of the specially packaged U by Kotex packs. What are you fall handbag essentials? This post is sponsored by U by Kotex and Walmart, but all opinions are all my own! Hand sanitizer, lip balm, tissues and allergy medicine are my essentials as well. Plus, I consistently carry Trident gum and some form of chocolate. 🙂 Thank you for sharing the coupon! Candra Evans recently posted…Starting a Healthy Hair Journey. Seven Tips To Get You Started. LOL! Chocolate in my purse is dangerous. hehe You are very welcome. The dreaded pinch! I think we can all relate to that at some point in time. LOL I LOVE U by Kotex! I’ve been using them for the past year (the cute packaging caught my eye), and can’t see myself switching anytime soon. Girl, that pinch is horrible. I thought I was the only one lured in by the colors. LOL! Make sure you grab the coupon then since you already use them.